Google has introduced its one of its recent services Google Latitude, where people have to register their mobile phones and start sharing their status messages and location with your friends live on the web. So if you happen to be around you can contact your friends and catch up with them. 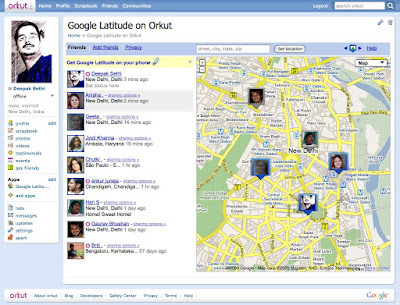 Now Orkut has introduced an app for Google Latitude. This is a big one up for Orkut users over other social networking sites. You must check it out if you have a compatible mobile handset.